The most frequent comment Becky Waddell receives about her store, Take Care, is that people don't want to leave. 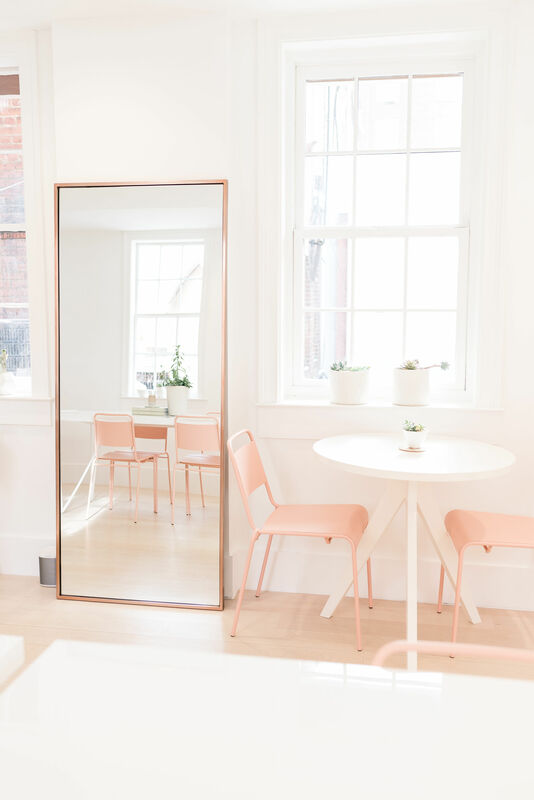 The independent beauty store in Washington, D.C., is an oasis in a hectic urban area — a building full of sunlight filtering through large windows, and soft, pastel tones. Stone diffusers fill the space with a fresh scent reminiscent of a luxury spa. "Everyone here says 'oh, I wish I could just hang out here. It's so soothing, it's so relaxing,'" she said about her brick-and-mortar location. Waddell's product selection focuses on natural ingredients for skin, hair, body and makeup, but there is a visible emphasis on wellness in her space, too. Shoppers can choose from a variety of supplements, crystals, and aromatherapy options and go to in-store classes about sustainable living, candle making and inner beauty. Waddell recently made the decision to add coworking to the list of services offered by her company. The front of the store remains a traditional retail space, but the rear houses her new "Workwell" shared office space. Here, subscribers can come to work for their respective industries while enjoying perks of membership including mini yoga sessions, cushions for meditation, a healthy snack bar with coffee and tea, and a small library on subjects that encourage mindfulness. Long tables have essential oils available that members can spray to support focus and balance. The messaging around Take Care's coworking venture is one of support, with the physical space built to reduce stress and anxiety. "I created the workspace I needed," Waddell said in an interview with Retail Dive. The word you will hear Waddell frequently use when describing the space and its connection to the retail portion of her business is "community." She is interested in creating touchpoints where people can gather, with the coworking arm of the business acting as an extension of the brand. "We just decided that we really wanted to double down on our community-building efforts," she said. "Having this space for people to be in a peaceful setting while they work, surrounded by people that value their own self-care and a norm of 'my personal wellness is not superseded by the expectations of my job' is super important." Waddell expects her members will be a self-selecting group who are drawn to Take Care's particular coworking concept and ideas around wellness, and that those who elect to be in the store's space will be focused on balance and searching for a natural approach to many areas of their lives, including work. Waddell's introduction of coworking at an independent store mirrors a trend that is happening nationally: retail is figuring out what to do with all its space. While the industry is in flux, big-box retailers are finding that they are over-stored and can save money with a decreased footprint or with better use of current real estate. As a result, companies are turning to a myriad of options to bring customers into stores while simultaneously using their square footage in a way that optimizes location. For example, Kohl's has dipped its big toe into wellness by hosting Weight Watchers meetings at its Chicago location. Additionally, in March the retailer revealed that it was opening 10 Planet Fitness workout centers adjacent to select Kohl's stores this year. And there are retailers who are already engaging with coworking as a concept. Staples was early on the trend, with the launch of its Workbar space at Boston-area stores in 2016. Workbar locations provide high-speed Wi-Fi, free parking and meeting rooms, among other services. Last summer Office Depot announced the launch of a coworking pilot, dubbed the "Workonomy Hub" to complement its "Workonomy" concept that supports small and medium-sized businesses. But the company looming largest in this space is WeWork, the coworking arm of The We Company, known for its global office space endeavors. WeWork offers private offices, shared workspace, and event areas with the stated goal of creating, "a world where people work to make a life, not just a living." The most visible connection between retail and coworking came in the form of The We Company's acquisition of the Lord & Taylor flagship store in a deal that cost WeWork $850 million. Beyond that, WeWork has made a number of moves to further its ties with retail, including partnerships with J. Crew and Rent the Runway and its launch of the WeMRKT concept — a dedicated retail space for WeWork members that is expected to open in 500 locations. In January the company debuted Made by We, located at 902 Broadway in New York, that the company said "will act as a new town square," so that it can "support mission-driven products and small businesses made by our members." The location features a retail concept that has a variety of products including snacks, apparel, travel and office items. Made by We has a cafe and communal work and meeting spaces. It also provides nearly 100 bookable workstations that the public can book via the company's website. "Traditional brick-and-mortar retail is a major space that continues to change, and an area where we feel we can make a real impact," a WeWork spokesperson said to Retail Dive. "Made by We was launched with the goal of creating a more connected life for our members…. [b]y connecting our community with the daily shopper, we can reimagine and reshape the retail experience so as to foster collaboration, innovation and creativity on a much larger scale." Retail expansion into coworking for both independent and large-format stores might simply be a smart business strategy. Commercial real estate firm JLL conducted a study last year which revealed that 43% of employed U.S. workers will be remote at least some of the time and flexible coworking spaces will grow to 30% of all office stock by 2030. The concept may drive a high-end consumer into those spaces, too, with the average household income within a 3-mile radius of a coworking retail space coming in at $100,000, according to the report. "It's really an extension of our approach to personal care, and also just trying to respond to the needs of the city." Diane Hoskins, co-CEO of architecture and design firm Gensler, recently touched on the topic when she spoke at the American Apparel and Footwear Association's 2019 Executive Summit. When talking about the future of department stores she said, "My gut tells me that the issue of too much real estate is going to have to get dealt with. Maybe it's creating coworking space from some of what is in that [department] store, and other kinds of uses." At the same event, Felix del Toro, senior vice president, chief merchandise and design officer at Fabletics, TechStyle Fashion Group, agreed with Hoskins about the future of retail and creative use of space. "I think the reckoning on space is certainly long overdue," he said. "The other conversation or another avenue for this is really: what is complementary? What gives the consumer another experience? Whether it's working spaces, how else can they carve up the space for it to be meaningful to add to that guest experience when they are in that space?" That search for meaning — and knowing that thoughtful commerce and community can co-exist — is what's driving Take Care's experimental, mindful approach to retail space. Coworking is a way of broadening Waddell's core mission. "It's really an extension of our approach to personal care, and also just trying to respond to the needs of the city," she said. "Any way we can create more space and build community is really important to me."